After almost a year of pursuing this lifestyle, I've come to learn that detours are absolutely essential to a successful roadtrip. Alabama Hills is just another huge example of that. 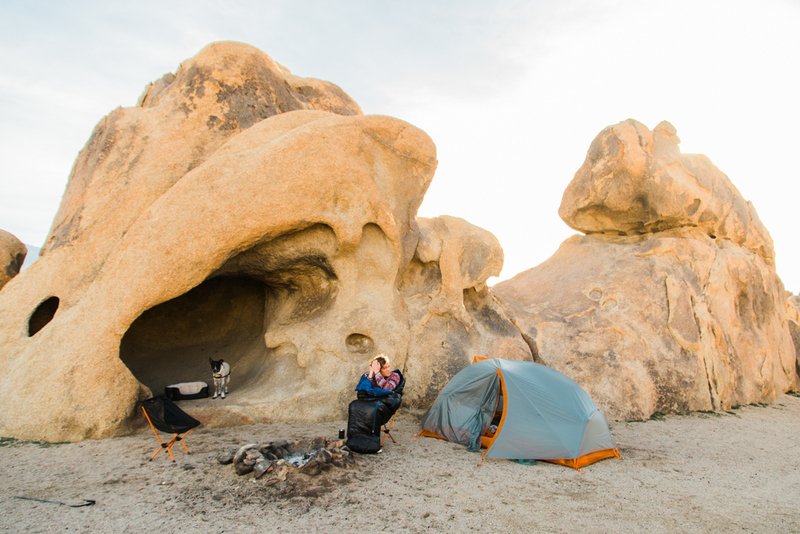 We planned this trip for Joshua Tree National Park, then figured we'd head to Death Valley National Park after, but after exploring Google Maps for the route, we came across Alabama Hills and decided we'd check it out. Within hours of arriving we had decided to re-structure our loose plans and spend a few days there before heading to Death Valley. This ended up being the highlight of our trip by far! Alabama Hills (or, the Bamas, as we've learned to call them) is an awesome little recreation area outside of Lone Pine, California, just on the eastern side of the Sierra Mountains. For this visit, we arrived at night and drove around on the dirt roads until we found a campsite that we were happy with. It ended up being one of my favorite places we've camped! Charlie curled up in his bed in that little cave for a few hours one night while Callen shot long exposures and I read in the tent. I always love nights like that, where we each do our own thing for a few hours and it really feels less like a trip and more like every day life.